Photo by Amy Barnes. Nostalgia on ice. Nobody here wants to get out of bed. It's an entirely reasonable approach to the rain, the wind, the dark and the looming holiday stress. Well, listen up, fellow blanket dwellers. The good people of Fortuna have given us reason to emerge from our soft furnishings: ice skating. Stormy out? No problem. The rink is open rain or shine. On a recent Sunday, I selected a favorite pair of socks and loaded up my antediluvian mommy mobile with friends and kids and headed to the wilds of Fortuna and Newburg Park, where the temporary rink is stationed. As the car's contents offloaded exuberantly, Tony Bennett wafted across the parking lot. Nice. There was an easygoing, festive vibe as we waited in line to pay for admission, sign a waiver, get a wristband and grab our skates. The rental skates were notably comfy. Both hockey and figure skating style skates were available, as well as tiny strap-on trainers for the very smallest of skaters. The process of getting in and booted up was straightforward, and everyone working there was pleasant and helpful. We waited about 10 minutes for the ice beneath the 40-by-90-foot tent to be resurfaced, as it is every hour or so to keep the finish smooth and navigable. Once the gates opened, skaters of all ages teemed onto the ice. First-timers clung determinedly to rink walls. Volunteers guided small children through the crowd by the armpits. Experienced skaters stole freely across the ice, circling the rink with a nostalgic ease. As far as field trips go, this one was easy. The snack bar at the rink offers reasonably priced items like chili, pizza, nachos and coffee. The potties are right around the corner, parking is close and there is ample seating for visitors who choose to spectate rather than run the risk of breaking a hip. The wholesome family atmosphere was reminiscent of times past. Dads trekked gallantly around the rink with a kid hanging off each arm. Grandparents sipped hot chocolate from paper cups and teenagers held hands while Christmas songs belted out of the loudspeakers. People were into it. The rink is well managed and safety is the top priority — evidenced by lots of signage and periodic reminders over the loud speaker encouraging everyone to be nice. On the whole, the herd of skaters behaved. It felt safe. There seemed no need to hide my shoes. Skaters seemed stoked to participate in something so new and different for Humboldt, and yet so familiar to the season. Volunteer Becky Coulombe said opening weekend turnout was phenomenal. "It was just packed. People were having fun, they were singing, they were out in costume, it was great." She added enthusiastically, "It was blowing, it was cold, and they were still skating!" In total, about 1,100 people showed up to skate on opening weekend, according to Nicole Genaro, one of seven committee members who spearheaded the skate rink project. "They are coming from all over the place," she added. "We advertised all the way up to Brookings." The committee, comprised of local business owners, budgeted $120,000 to host the rink. The tenacious group raised half of the funds needed between September 2014 and the rink's grand opening on Dec. 4. "The rink has been funded solely by donations and sponsors," Genaro explained. "And people are still donating." The committee is confident that ticket sales will make up the rest of the expenses. Genaro said they hope to host the ice rink again next year, adding, "Our long term goal is to be able to have a year-round rink here in Fortuna." If you're not able to set aside the shopping list and the recipe book before Christmas, no worries. 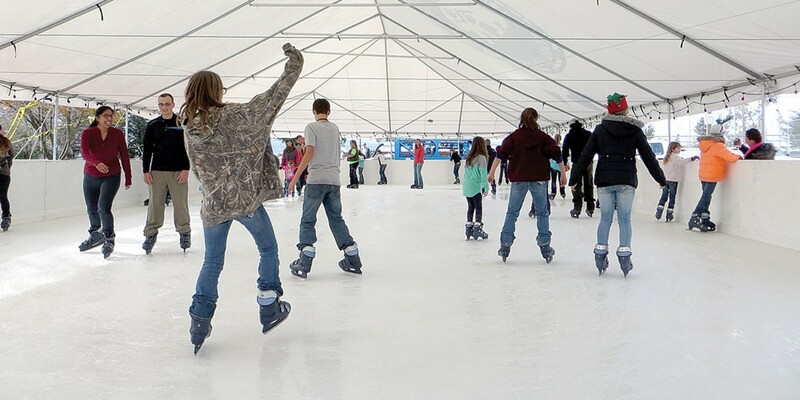 The rink will be open through Jan. 17. Be sure to check its hours online before heading out as the schedule is kind of random due to school field trips. Public skate hours are posted on www.humboldticerink.com and on the Humboldt Ice Rink Facebook page. Admission is $12 for adults, $8 for children. This includes the cost of skate rental and a 90-minute session on the ice. Staff are fairly relaxed about the timing, though, and allow folks to continue skating past 90 minutes as long as they're not running low on skates.